Part of the reason the soup doesn't dazzle me is the price  up to $100 a bowl in some restaurants. It's hard to say what a $100 bowl of soup should taste like, but this isn't it. Of course, the price is part of the point: shark-fin soup is a luxury item in Hong Kong and China, its biggest consumers; it's a dish that embodies east Asia's intertwined notions of hospitality and keeping (or losing) "face." Once favored by Chinese Emperors for its rarity, shark-fin soup is now eaten at weddings, corporate celebrations and high-falutin' business lunches to demonstrate a host's good fortune. 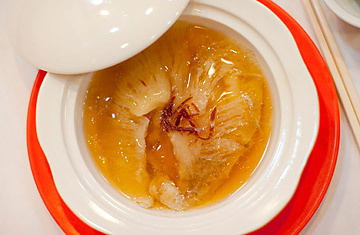 "It's like champagne," says Alvin Leung, owner of Bo Innovation, a two-Michelin-star Cantonese restaurant in Hong Kong. "You don't open a bottle of Coke to celebrate. It's a ritual." Unfortunately, this gesture of largesse comes with a price tag much bigger than that $100 bowl. Last week, as millions of viewers in the U.S. tuned in to Discovery Channel's Shark Week, probably nearly 1.5 million sharks were killed in the shark-fin industry  just like the weeks before. All told, up to 70 million sharks are culled annually for the trade, despite the fact that 30% of shark species are threatened with extinction. Indonesia, India, Taiwan, Spain and Mexico land the most sharks, according a recent survey of global shark populations conducted by the Pew Environment Group. "Sharks have made it through multiple mass extinctions on our planet," says Matt Rand, director of Pew's Global Shark Conservation division. "Now many species are going to go the way of the dinosaur  for a bowl of soup." The shark-fin industry has gained notoriety in recent years not just because of what it's doing to the global shark population but also because of what's known as finning  the practice of catching a shark, removing its fins and dumping the animal back into the sea. While a pound of shark fin can go for up to $300, most shark meat isn't particularly valuable, and it takes up freezer space and weight on fishing boats. Today, finning is illegal in the waters of the E.U., the U.S. and Australia, among others; boats are required to carry a certain ratio of fins to carcasses to prevent massive overfishing. But there are loopholes in antifinning laws that are easy to exploit. In the E.U., for example, ships can land the fins separately from the carcasses, making the job of monitoring the weight ratio nearly impossible. In the U.S., a boat found carrying nearly 65,000 lb. (30,000 kg) of illegal shark fins won a court case because it was registered as a cargo vessel, which current U.S. finning laws do not cover. "There's definitely a black market out there," says Richard Fitzpatrick, a filmmaker and marine biologist who studies shark behavior on the Great Barrier Reef. "To what degree it is, we don't know." Sharks populations can't withstand commercial fishing the way more fecund marine species can. Unlike other fish harvested from the wild, sharks grow slowly. They don't reach sexual maturity until later in life  the female great white, for example, at 12 to 14 years  and when they do, they have comparatively few offspring at a time, unlike, say, big tunas, which release millions of eggs when they spawn. (Not that overfishing has left big tunas in much better shape than sharks, but that's another story.) As a result, the sharks that are netted are either adolescents that have not had a chance to reproduce or are among the few adults capable of adding new pups to the mix  and never will. "The shark stock on the Great Barrier Reef was hit hard when fishing started in earnest here 30 years ago, and it hasn't recovered at all," says Fitzpatrick. See 25 more authentic Asian experiences.